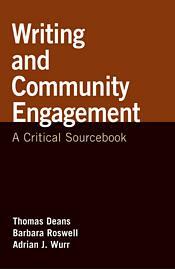 Writing and Community Engagement: A Critical Sourcebook (Bedford/St. Martin’s, 2010). Ed., with Barbara Roswell and Adrian J. Wurr. 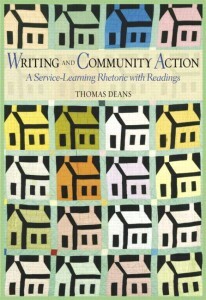 This book collects key research on the theory and practice of community-based writing. Selections from community projects are also included to help connect scholarly and pedagogical work. Chapters address writing in communities, ethics, community engagement, service-learning, the rhetoric of civic writing, and practical pedagogy. This book encourages inquiry into community and social action issues, supports community-based research, and shepherds students through a range of service-learning writing projects. Several chapters offer pragmatic advice for crafting personal, reflective, and analytical essays, while service-learning chapters present experience-tested strategies for doing collaborative writing projects at nonprofit agencies, conducting research on social problems, writing proposals that respond to campus and community concerns, and composing oral histories. The assignments help students to see themselves as writers whose work matters. Provocative readings spark critical reflection on community service and a range of social concerns (including economic justice, literacy, education, homelessness, race, and identity). Focusing on invention, audience analysis, and the social purposes of writing, Writing and Community Action encourages students to adopt a rhetorical frame of mind. Writing can serve as action in both academic and community contexts. Writing Partnerships constitutes the first comprehensive overview of service-learning in composition studies and will be of particular interest to educators at the high school through university levels who want to combine writing instruction with community action. Deans describes three kinds of school-community partnerships: writing for the community, writing about the community, and writing with the community. College-level case studies are woven into discussions of how service-learning relates not only to first-year, upper-division, and technical writing courses, but also to critical pedagogy, writing across the curriculum, ethics, and literacy. Appendices include descriptions of more than 60 writing-centered service-learning courses and programs, as well as a sample syllabus, student writings, and a list of resources for service-learning teachers and administrators.